Located in the northwest of Rutland, England’s smallest rural county – only the City of London, the City of Bristol and the Isle of Wight are smaller – Whissendine is a village and civil parish and home to approximately 1,300 people. Tucked away off all main roads, Whissendine’s 1,300 inhabitants enjoy the tranquility of beautiful rural surroundings and easy access to local market towns. 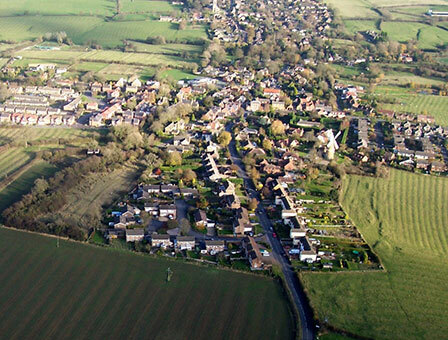 The village has at least 1,000 years of history, as it’s mentioned in the Domesday Record, but the first settlement was probably some four to five hundred years earlier. The name’s origin, Wyckinga’s Den, is Anglo Saxon and means ‘valley with a stream belonging to Wick’s people’. The Whissendine Brook is still a central feature of the village. On high ground at opposite ends of the village are two fine Grade 1 listed buildings which dominate the skyline and welcome visitors: St Andrew’s Church and Whissendine Windmill. The church is one of the largest in Rutland. Its impressive 100-foot tower can be glimpsed across the rolling countryside from several miles away. Strung around and between there is a mix of housing, from thatch and mud cottages to 21st-century conversions and new developments, with around five hundred and fifty homes in total. There are 20 listed buildings in the village and one Scheduled Ancient Monument: Moor Lane, a Medieval moat. Whissendine is a sought after village to live in, with its outstanding primary school, pub, village shop and working windmill.